View looking west at Mt. 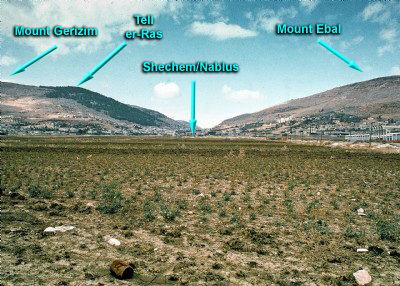 Gerizim (on the left, south) and Mt. Ebal (on the right, north). In the center between them (not visible) is Shechem and "Jacob's Well." According to Deut 11:29 the recently arrived Israelites were to recite the blessings of the Covenant on Mount Gerizim and the curses from Mount Ebal (cf. Josh 8:33).